I started a new series that I’ll be aiming to post on Mondays until it’s completed. I’m pretty excited about it and hope you’ll be just as encouraged in it as I am! I’ve really been trying to focus on Proverbs 31 about The Wife of Noble Character. Each week I’m trying to take a verse or two from it and dissect it and just really think on what is being said through it. I really want to lean into the wisdom that is inside these verses. There is so much- SO MUCH for me/us to learn from this woman. And there’s so much I neglect, but that I aspire to be when I read these verses. It’s inspiring, convicting and encouraging all at once. I hope that this series encourages you too. Last week, I only talked about verse 10 and what a wife of noble character means and is. Well, I scratched the surface of it, really, as I’m sure we could have enormous discussions on what it means to be a wife of noble character. If you’d like to read that post, you can check it out HERE. I’ve thought a lot about that this week, and it really has encouraged me. I’ve thought a lot about my character this week and what I do AND don’t like about it. And what I need to work on. It’s sort of humbling to think about your character, isn’t it? When I thought about whether or not my character was NOBLE or not, I was definitely convicted. But I was also encouraged because it showed me so much of what I desire to be. – full trust; belief in the powers, trustworthiness, or reliability of a person or thing. Having every confidence in their ability to succeed. This woman’s husband TRUSTS her. He BELIEVES in her. And he knows with full confidence that she will be successful at whatever it is that she does. I think that the next verse, verse twelve, speaks to her very character right off the bat. It says that she brings him good, not harm, all the days of her life. Breaking this verse down, first I see that she BRINGS him good. It doesn’t say that she waits until he deserves it, presents it whenever she feels like it, or that she only gives it to him sometimes. It says she brings him GOOD not harm, ALL the days of her life. No exceptions. I think it’s so easy to forget this as wives. Isn’t it? It’s always really easy to think about what our husbands aren’t doing and to bring a critical spirit. It’s easier to focus on the negative, and to see the things that don’t get done. I’m guilty of this sometimes. When I think about what it means to bring good, NOT harm to our husbands, I think this can mean many, many things. It can mean just bringing a joyful spirit to your home. It can mean lifting him up when you’re around your peers, instead of talking negatively about him in front of other people. It can mean being his biggest supporter, no matter what life may bring, until the day you die. It can mean just being content in your life. Or just proud of him for working so hard. Or just because he’s an amazing dad. It can mean bringing words of affirmation into your home and lifting him up, even when you don’t feel like it. It’ll look a little different for all of us in our lives. But what I’m reading doesn’t say WHAT good we are supposed to bring. But we are just supposed to bring it. And we are called not to harm him. It doesn’t say that you can bring him harm a little bit if he really deserves it, or that you can just bring him down verbally behind his back a little bit because he really made you mad. It says that no harm should be brought to him. He is protected by his wife, in many ways, ALL the days of her life. ALL of them. And I think he has full confidence in her because of this. He KNOWS she’s got his back, come what may in this life time. And she also flourishes because he trusts her so much. What a beautiful, beautiful verse. One I never really took the time to ponder. I think a wife like this really starts from within. It starts with your character. Excellent character that does nothing but bleed out joy, happiness, trust and goodness. A character that moves you to go out of your way to bring your husband good to his life, ALL the days of yours. One where harming him isn’t even an option. She trusts him too. And it’s a really amazing cycle that I see here in these two verses. I love being a wife. I really do. But it’s so easy to go about all the to-dos of the day and to forget to view your relationship as a ministry. As a mission field. It’s easy to forget that we are called too, to serve our husbands and to bring good to their lives. To let is spring from the depths of your character so it is a true reflection of your heart. Even three verses in, I’m seeing how important our characters as women really is. How matters of the heart really do matter. For what your character really is, is what will flow out. And what flows out spills onto others. Onto our husbands. And our children even. Our character is a direct reflection of where our heart really is. Who we REALLY are. And how we treat people. Most importantly, our husbands. Phew. It’s heavy stuff to my heart. But so, so good. I am a part of a book club with three other ladies, who I just love to pieces. We’ve been in this book club together for I think 4 years! And we’ve met every single month over good food and good conversation about whatever book we just finished. It’s so much fun and something I think I’ll be a part of a long, long time. I don’t get to see these three ladies that often, but we can always count of hanging out once a month for sure. And I love it. After I had Cruz, I totally stopped reading for book club. My days were crammed full with being a brand new mom and being a brand new business owner. Finding time to read was really hard and something that was put on the back burner. I hated it because I love to read and I missed it. I still went to book club and always came saying, “Yep, I didn’t read… AGAIN.” The girls started not being surprised that I hadn’t read that months selection. But I FINALLY am getting back into the swing of it. And I actually read our last book!!! We met up last night over pizzas, salads and wine and I was actually able to join the conversation about the book! I’m telling you all of this because I want to encourage you to read the book we just read, and to maybe start a book club of your own! It’s truly one of those things that I only do for me and it’s something that I do that doesn’t require being a mom or talking about being a mom. It’s just 4 women getting together as friends to discuss something other than that. Of course, we all have kids and it comes up- obviously- but it’s a nice break for all of us to catch up, relax and laugh together as girls and as friends. I’ll always be friends with these three. They are fabulous ladies. 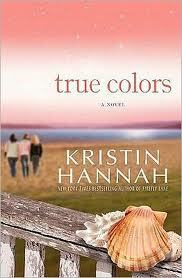 The book we just finished is called ‘True Colors’ by Kristin Hannah. I know you’re probably wondering when you’re going to be able to find time to read, but if you enjoy reading make time for it. It refuels me in a lot of ways and knowing that three other people are reading the book with me is really a lot of fun! Check it out. It’s a good read! I’m feeling gloomy today. Do you ever feel like that? I have been feeling like I haven’t been that great of a friend lately. And today it’s hitting me and I guess that’s what’s making me feel down. Before I had Cruz, all of my time and efforts were pointed towards Jason and all of my friends. I had many lunch dates, I could go out after work, weekend etc. I still do these things. Having a baby definitely changed everything, but I actually still do see a lot of my friends and try to make time for others as much as possible. I spend so much time working (not as much as I would if I worked in an office, Jason always reminds me), but it’s been really hard for me to find a balance lately. I feel like I’m on the ‘taking’ end of friendships a lot these days. So many people help us out. So many people watch Cruz for us while we work. So many people do so much and go out of their way for us so much. I haven’t been as good at ‘giving’ of myself to people as I would like. My fear is that people will just see me as a ‘taker’ and I hate that. It’s just a season, I know. And the true friends that I will have in this life will stick around no matter what. This season will pass and then I will be able to give more of myself in a new season. But for now I’m struggling with it. Finding balance in any situation you’re in is hard. I just miss a lot of my friends. My attention is always focused on Cruz and our business. It has to be because we’re just trying to make ends meet right now. And even though I’m working at something that I love more than any job I’ve ever had, sometimes it’s stressful. I don’t wish for things to be different at all. But our current situation is leaving little time for me to cherish my friends the way I want to.